Happy New Years guys! So I decided that I would being the year off by apologizing for my absence toward the end of last year and also let you guys on what the New Year means for me. I photographed some of the things that I believe will be essential to my day to day sanity in 2013. The first thing being several of the lip products I can't put down at the moment. I can't forget about an accessory that means so much to me (a watch gifted from my lovely boyfriend). 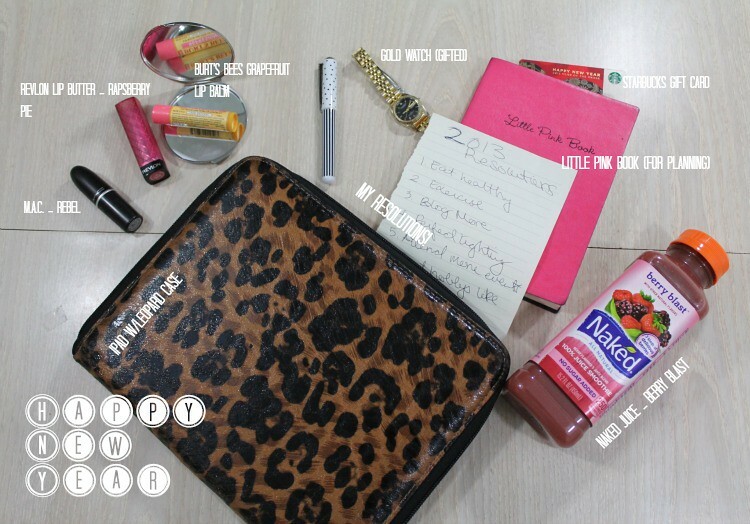 Next is a a notebook where I jot down all of my to-do list and ideas for the blog and my beauty channel. I debated buying a new planner and I'm still on the fence but this one is so cute. Tucked inside the notebook is Starbucks gift card which means lots of Passion Fruit Teas and coffeeshop blogging. The juice is a new favorite which I just stocked up on after trying a bottle. This represents my efforts to make healthy choices in the new years. I also plan on using my iPad a lot more for those times when I'm mobile. It fits right in my purse so its perfect! My list of resolutions is hiding there too! I know everyone says that resolutions are pointless but I have decided to take a different approach this time around. I think making the decision not to make resolution is overrated!! I'm ready for a fresh start and I am all about being inspired and putting that to use. The insanely stylish Karla Deras is currently my screen saver at the moment and it's definitely motivation. I'm also going to do a little bit of renovating on Roses are Red so don't freight when the layout changes mid browsing. I love you guys and Happy New Years!